Dr. Dennis Gravatt, Stephen F. Austin State University associate professor of biology, assisted students as they separated and characterized color dye molecules in candy during a STEM Day session. For more information about SFA's College of Sciences and Mathematics, visit cosm.sfasu.edu. 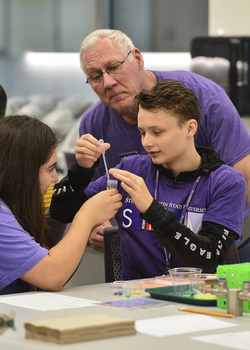 NACOGDOCHES, Texas - Stephen F. Austin State University's eighth annual STEM Day provided more than 350 area high school students an opportunity to learn about science, technology, engineering and math through faculty-led sessions, student panels and a physics magic show. Working alongside SFA students and faculty members, students learned how STEM integrates across disciplines through hands-on, interactive activities, said Adrienne Aul, STEM Research and Learning Center programs coordinator. "This event gave students exposure to different areas that many have not experienced before and made students more aware of career possibilities within STEM disciplines," Aul said. Students chose between 22 different sessions covering a variety of subjects, including a presentation on fiber optics by event sponsor, Suddenlink. "It is our commitment as a technology and communications company to support and inspire the next generation of leaders, and we are honored to partner with SFA and local school districts who share our commitment," said Travis Nance, Suddenlink regional vice president of market engagement. "Through this partnership, we can provide innovative ways for our high school students to gain additional learning opportunities, so they get the foundational STEM skills and knowledge needed for careers in technology."